Ask a Pharmacist is currently not available. Please check back for updates. If you are a Veteran, the Ask a Pharmacist App enables you to access information about VA pharmacies and medication easily — with the comfort of knowing the information is valid and from trusted sources. If you have a verified My HealtheVet account (credentials for VA's personal health record), you can link to VA pharmacy and Secure Messaging services via the app, allowing you to quickly go to your personal medication and health information as well as learn about pharmacy-related topics. Access information about VA pharmacies and medications easily – with the comfort of knowing the information is valid and from trusted sources. Learn about prescription refill and pharmacy services, including the ability to refill and track your VA prescriptions. Learn how to read a prescription label and identify pills by sight. Access reliable, VA-approved resources about types of drugs as well as administering and disposing of medications. Easily locate your VA pharmacy, and learn how VA pharmacies operate. Learn about sending a Secure Message to your VA care team. What is the Ask a Pharmacist App, and why should I use it? The Department of Veterans Affairs (VA) Ask a Pharmacist mobile application (app) allows Veterans to access information about VA pharmacies and medications easily – with the comfort of knowing the information is valid and from trusted sources. If Veterans also have a verified My HealtheVet account (credentials for VA’s personal health record), they can link to VA pharmacy and Secure Messaging services via the app, allowing them to quickly go to their personal medication and health information as well as learn about VA pharmacy-related topics. The app helps to provide more understanding on how VA pharmacies operate, where your nearby VA pharmacies are located, information about medications, and how to better identify pills simply by sight. Who can use the Ask a Pharmacist App? Anyone can access the informational resources about medications in the Ask a Pharmacist App. However, to use some of the features the Ask a Pharmacist App helps you learn about, you must be a Veteran receiving VA care and have an Advanced or Premium My HealtheVet account. My HealtheVet offers three account types. Basic Account: Anyone can register for this account type. It allows you to self-enter your personal health information, which can be viewed or downloaded using the VA Blue Button. You may use the journals and other tools to track your health measures. However, you cannot view your personal information located in VA or Department of Defense (DoD) systems. Advanced Account: This account is only for Veterans/VA Patients. It is a higher level of access that may provide you the ability to view and refill your VA medications online. This account does not require that you have your identity Authenticated*. Having an Advanced account paves the way for you to get a Premium account. Premium Account: This is the highest level of access to My HealtheVet features for Veterans/VA Patients. To get this type of account you need to complete Authentication*. You will have to log into My HealtheVet with your My HealtheVet User ID and Password to use the many features within the site. The Ask a Pharmacist App allows you to easily link to features within My HealtheVet, but does not duplicate them or allow them to operate within the app itself. How do I set up my My HealtheVet account so that it works seamlessly with the Ask a Pharmacist App? Create a Basic My HealtheVet account by completing the registration page. When you register as a VA Patient, your profile information is linked to VA/DoD records. When this happens, you are given an Advanced Account (an Advanced Account is required to refill prescriptions). In-Person Authentication* (IPA) at your local VA Medical Center or Community Based Outpatient Clinic (CBOC). Online Authentication* through www.ebenefits.va.gov. This is for users who have a connected eBenefits DS Logon Premium account & My HealtheVet VA Patient account. What are the app’s main features, and how do I access them? To access them, go to the Home screen, and tap the tab of the information you would like to view or the tool you would like to access. What is the Prescription Refill and Pharmacy Services feature, and how do I access it? Most selections will direct you to an external website, which will usually be My HealtheVet. What is the Pill and Bottle Information feature, and how do I access it? Depending on your selection, you may go to an external website. What can I find under VA Trusted Medication Resources, and how do I access them? 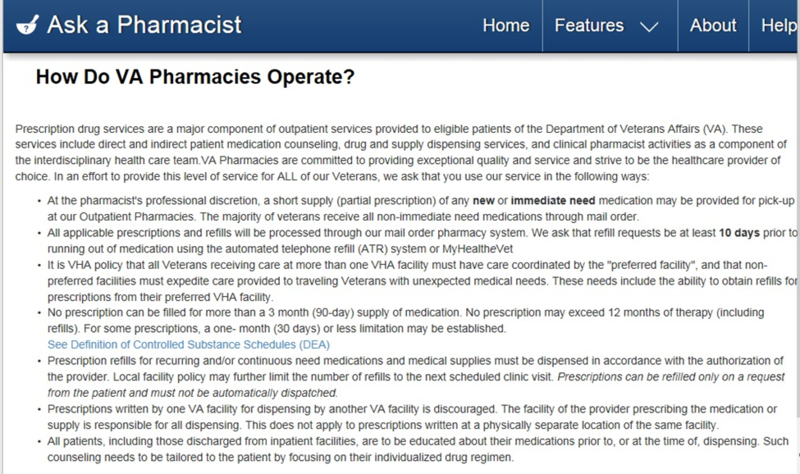 What information can I access in the About VA Pharmacies feature, and how do I access it? What is My HealtheVet's Secure Messaging feature, and how do I use it? Secure Messaging is a feature available within My HealtheVet that allows you to send a secure, protected question or note to your VA care team. The Ask a Pharmacist App links to information about this feature within My HealtheVet. You can access this information either on the Home screen or from the Features drop-down menu, and then tap Send a Secure Message. You will go to a page on the My HealtheVet website where you can learn more. In order to send a Secure Message, you will have to have a My HealtheVet Premium account, and then log into My HealtheVet with your credentials to use the feature within the site. What is VA Mobile Health? VA Mobile Health is an initiative that aims to improve Veterans’ health by providing technologies to expand care beyond the traditional office visit. As part of VA Mobile Health, VA is releasing a series of secure apps that take advantage of the popularity of wireless technologies to support Veterans, Caregivers and VA care teams. What do I do if I need additional information or help? User Manual, Slideshow and Quick Start Guide for the Ask a Pharmacist App are available at mobile.va.gov/training. If you need help with the Ask a Pharmacist App, dial 1-877-470-5947 to speak with a VA representative. The Help Desk is open weekdays from 7 a.m. to 7 p.m. CT. For TTY assistance, dial 711. Where can I find additional information about other available VA Mobile Apps? Additional information about other available VA Apps can be found on mobile.va.gov/appstore as well as mobile.va.gov in the VA Mobile Apps General FAQs. If you have technical trouble using this app, please contact the VA Mobile Health Help Desk for Veterans at (877) 470-5947 and VA Care Teams at (844) 482-6624, Monday through Friday 7 a.m. - 7 p. m. CT for TTY assistance, dial 711.